Anyone using a firearm for target practice will agree that the use of an installed red dot sight is key to being able to learn how to shoot a target. While many believe that red dot sights enhance accuracy, the truth is that they mainly provide you with faster aim and increase your precision. Red dot sights are more common for military training, but you will find that they work for recreational firearms as well. 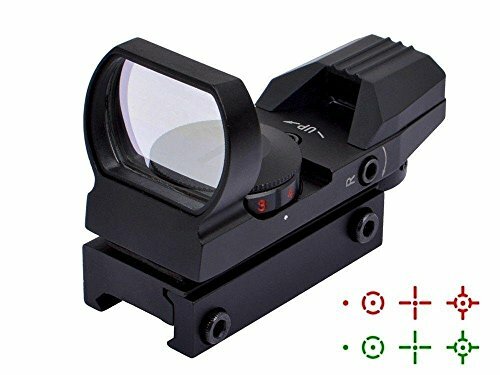 If you are looking for a better way to attack moving targets at shorter distances, then you will find that the Feyachi Reflex Sight is more than useful in this field. In this article, we will go over the pros and cons of owning the latest Feyachi Red Dot Sight. The Feyachi provides you with a 4 in one reflexive red dot sight. It features a newly upgraded sighting system which helps with enhanced target acquisition. With the newer design, it helps you have a wider range of vision. The new dot system is also adjustable, which allows you to use four different styles of a reticle. This model is also made to be lightweight yet durable, which means that it’s excellent for regular use. Red dot sights are best used for the recreational or professional use of firearms. Generally speaking, red dot sights are used to train shooters to be more accurate, and you will mostly find that military and police forces use them for training their men. However, today, more and more people are also using it for recreational purposes. As long as you have a drive for increasing your aiming accuracy, the Feyachi Reflex Sight will surely come in handy for you. This sight features four different reticle styles, which means that you are actually getting a four-in-one deal. The first one is a regular dot, which provides you with a small red dot that is presented on your target. As for the second one, there is a circle with a small dot displayed in the middle, and this can help you target specific locations better. The next one is a dot crosshair and circle, which can give you enhanced precision. Lastly, you also get to enjoy a combination of all three styles, which can help you in a variety of different situations. Featured on this device is a 33 mm lens, which helps you achieve quicker target acquisition. On the other hand, the wide scope of view can help you maintain enhanced awareness. It increases your field of vision at the same time too. Durability is a must when it comes to sights. Luckily, the Feyachi Reflex Sight boasts increased durability. This is due to its secured, rail-mounted system. This ensures that it won’t fall off or loosen over time. Because of this, you can expect the Feyachi to last over a longer period of time. Aiming is the ultimate goal when it comes to using a sight, so having a parallax-corrected and unlimited eye-relief feature can definitely help you lock on to your target easily and confidently. You will be able to follow the dot easier too, which can help enhance your aim. Other remarkable features that the Feyachi Reflex Sight has are an ultra-lightweight body, waterproof coating, and a shockproof exterior. The sight is powered by a 3V lithium battery, which also already comes with the kit. Using a sight can help enhance your field of vision and increase your accuracy. With firearms, you will find that learning to aim where the bullet lands is going to be difficult at first, hence the reason why a red dot sight can help improve your shooting capabilities. How can you do it? First, you will need to attach the sight onto your firearm securely. In order to do this, simply make sure that the sight is unlocked and that it slides onto the barrel of the gun. Push it down until it reaches the right angle, and then secure it using the rail. After installing the sight onto your firearm, you’re going to want to put in the 3V battery. Once done with this, then you’re ready to go! Similar to the Feyachi Reflex Sight is the DD Dagger Dot Reflex Sight. This one has a relatively simple design, but it comes in a sleek black look. It features both red and green dot sights, which have four different positioning reticles each. It comes equipped with a lock set screw to help adjust the sighting too. In addition to that, the DD Dagger Dot Reflex Sight also features elevation and windage adjustments. These can be changed using the hex wrench that comes with the kit. You will be able to rotate a knob, which adjusts the brightness, intensity, and switches between both green and red reticles. Learning how to shoot a firearm efficiently can be daunting, especially if you’re new to operating one. To help enhance your performance, you can choose to get a sight. The Feyachi sight comes equipped with four different styles that you can use to enhance your aim effectively. If you’re looking for a simple sight that has a multitude of features, then this is the right one for you.